If you read the comments section found below many of our articles, you know that questions like the ones above are very important to many of our readers. The rules of the Lifeline Assistance free government cell phone program have always said that only one cell phone is allowed per residence. Unfortunately, that has meant that many needy, deserving people were denied phones because someone else living at their group residence already showed up in the government’s national fraud protection data base. But that needn’t be the case. There is a way for you to get a free government cell phone even if someone else at your shelter already has one. All you need to do is fill out what’s called a “one-per-household worksheet.” Each phone vendor should have a worksheet upon request. You can find an example of the worksheet, along with further information, on the Universal Service Administrative Company (USAC)’s website here. You can also view a copy of a sample worksheet by clicking the thumbnail to the left. Is this real? Can you really qualify for a free government cell phone even if you live in a group home or shelter? Absolutely. In fact, some cities are now actively seeking out individuals who didn’t qualify for the program under the old rules. For example, SFGate.com wrote about Bevan Dufty, the head of San Francisco’s municipal homeless initiative and part of the the city’s Coalition on Homelessness. – If you checked YES, you may not sign up for Lifeline because someone in your household already receives Lifeline. Only one Lifeline discount is allowed per household. – If you checked NO, please answer question #2. 2. Other than a spouse or partner, do other adults (people over the age of 18 or emancipated minors) live with you at your address? If you checked NO for each statement above, you do not need to answer the remaining questions. Please initial line B, below, and sign and date the worksheet. If you checked YES, please answer question #3. – If you checked NO, then your address includes more than one household. Please initial lines A and B below, and sign and date the worksheet. – If you checked YES, then your address includes only one household. 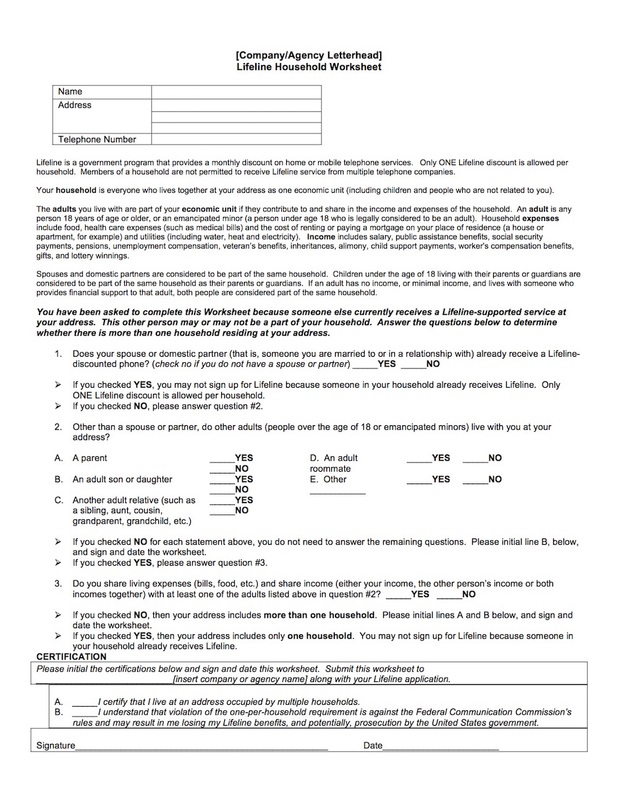 You may not sign up for Lifeline because someone in your household already receives Lifeline. 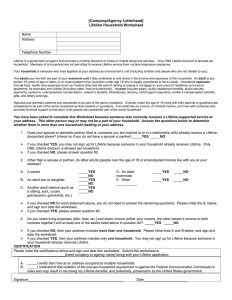 If you live in a group home or shelter, and feel you qualify, give one of the Lifeline cell phone companies a call and be sure to tell them you are requesting the “one-per-household worksheet.” You can find a list of phone providers by state when you click here. I have a question in the group home category about applying for a cellphone. I currently live with family, however there is a woman living with us who is not related to us paying rent to the household to live here. She is currently on Q-Link Lifeline program. I am also currently paying rent and am on SNAP Foodstamps program and need a cellphone in order to find myself a job. Would I be able to apply for a cellphone if i am living with an unrelated person in the same household who is also on the lifeline program? It sounds as if you both qualify, but you should doublecheck it with your preferred service provider. My disabled son lives in a 4-person group home in Wisconsin. I know that none of the other residents have a cell phone as they are non verbal. My son receives SSI, which pays for various expenses. He also receives Medicaid. The State of Wisconsin under Easter Seals Wisconsin pays his expenses through that funding. His SSI is used for clothes, outings, personal items, etc. Would he qualify? The group has their own landline. It certainly sounds as if he would qualify. Residents of group homes are eligible to receive free government cell phones, but you must make sure you speak to customer service and fill out the proper “group home” forms. As a Florida Safelink Agent… I can say that the key to qualifying as a resident of a shelter, group home or nursing home, is that you’re identified as an individual household and do not share expenses with any of the other residents. However, with SafeLink, there were instances where an address for a shelter was blocked as an invalid residence address, and I had to call support to have that shelter address unblocked. Borrow a phone from a friend or neighbor, Latoya. Or apply online at your chosen Lifeline company’s website. does little good. I called Safelink and never got the application they said they would mail to me. An hour on the phone for nothing! What a joke! Getting the address of a shelter unblocked would be nice but I don’t know how to do it. The operators that you talk at these companies can’t do much except fill an application out over the phone. They are of very little help. The system is really broken. Four months trying to get a phone! This is a common problem and the USAC is very experienced at helping people in your situation. Hi, my name is Amanda Rivera. I am currently in a Hope for Youth Shelter and i was wondering if I qualify for an assurance phone. If so, what would i need to do ? Are you 18, Amanda? The rules of the program say you need to be 18 or older to qualify. Go back over the article above to learn more. Go through the list to find the plan that fits your needs best — the most minutes, most texts, data plan, etc. Then contact the company you choose to ask for that “one-per-household work sheet.” Good luck, Jeremy. if you filled out the application wrong how long will it take to make a correction? Or will that be impossible if you apply online? Contact your service provider’s customer service team by phone (if possible) or do an online chat. If you can’t correct the mistake, you should be able to apply again. you need to get some kind of government assistance AND be below 15k income for single…. My wife is in a nursing home and she has filed for Medicaid. I’m pretty sure she will be approved. Will she be eligible for a free cell phone and 250 minutes a month so that her family can keep in better contact with her if approved. Next Post: Question of the day: Is there a website with all the dates and times of places where you can get a free government cell phone?